Falcons TTC booked their place in the final of CEAT UTT with a thumping 14-5 win over DHFL Maharashtra United at the NSCI Stadium in Mumbai in the inaugural season of the six-team UTT. Working on a lead of 7-5 from Day 1, Falcons were relentless on Day 2 of the semi-final and went on to with all 7 of their matches on the day. They have dominated from the starting of the tournament, finishing on top of the 6-team League table with 78 points, followed by Shaze Challengers (73), Dabang Smashers TTC (69), DHFL Maharashtra United (64), Oilmax Stag Yoddhas (61) and RP-SG Mavericks (60). Maharashtra United started strongly with Hong Kong world No. 8 Wong Chun Ting putting them ahead with a 2-1 win over Sanil Shetty in the men’s singles (Foreign v Indian) in the first match of the tie. Falcon’s Chinese Wu Yang brushed aside Pooja Sahasrabudhe Koparkar (Maharashtra United) 3-0 in the women’s singles for the Falcons to move 4-2 ahead on points. 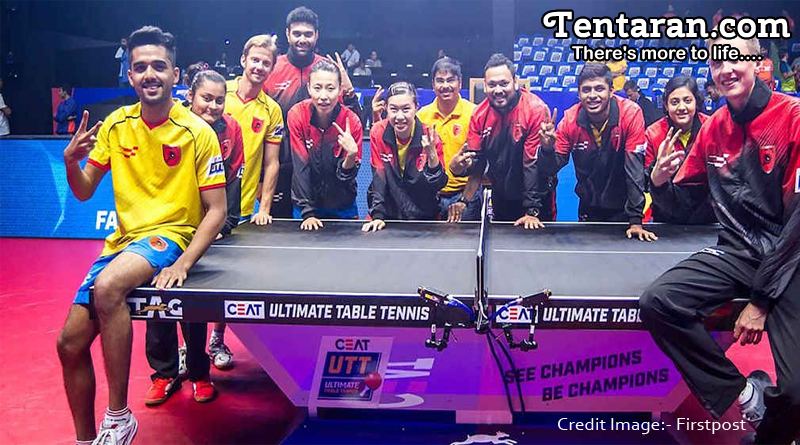 Moving onto mixed doubles Maharashtra United’s pair of Harmeet Desai and veteran Fu Yu edged out Sanil Shetty and his partner Lee Ho Ching 2-1 to reduce the Falcon’s lead to 4-5. Liam Pitchford pulled off the result of the night to win against Wong Chun Ting 2-1 in the men’s singles (Foreign player category) to extend Falcons TTC’s lead to 7-5. The most anticipated match of the semi-final was between Wu Yang and Liu Jia. Yang was in fine form throughout the Match and won 11-5, 11-5 and 11-6 to give Falcons a lead of 10-5.Sutirtha Mukherjee sealed the Tie 14-5 for Falcons by winning the opening Game of Match 7.